Linen is warp based saree. When using linen yarn and weft then linen called linen by linen. If adding other yarns of 30 to 40% khadi, cotton and silk in linen. Then we can called linen by khadi, linen by cotton or linen by silk. Linen has the tendency to be stiff. When linen is combined with khadi, cotton and silk then the saree is become softer. Linen fibre derived from the middle of the flax plant, so it will be naturally thicker than the cotton. When you are buying pure linen sarees that time you have to check thread count. Thread count is nothing but counted up to the vertical (warp) and horizontal (weft) weave of the fabric. Linen sarees thread count in between 60 to 100 count. 60 count is the minimum and 100 count is the maximum. Some people says 120 count also but is not possible, it is a sales trick to sell their product. 100 count is the best to purchase linen sarres. Everybody knows linen is for summer, but Linen is wearable throughout the year in Indian conditions. Linen sarees comfortable and has sweat absorbing properties. Benefit of wearing linen sarees during summer is that it allows easy air flow and reflects heat better. Linen sarees are 30% stronger than cotton sarees. Cotton sarees can be quite soft and silky straight, whereas linen sarees tends to be stiffer. Compare with last 50 years the end use for linen has changed very high. Approximately 70-80% of linen production increased for apparel textiles. Where as in the 1970s only 5% used for fashion fabrics and 1990s it is increased to 50-60% and now it reached to 70-80%. Flax grown in many places of the world. But best quality flax grown in Ukraine and Western European countries. In recent years bulk linen productions has moved to China and Eastern Europe. But high quality fabrics are still available in Ireland, Italy, Belgium, Poland, Austria, France, Germany, Sweden, Denmark, Belarus, Lithuania, Latvia, Netherlands, Spain, Switzerland, Britain and kochi in India. Linen sarees Price range starts from in between 1000 to 3000. Linen sarees available on online shopping in india. 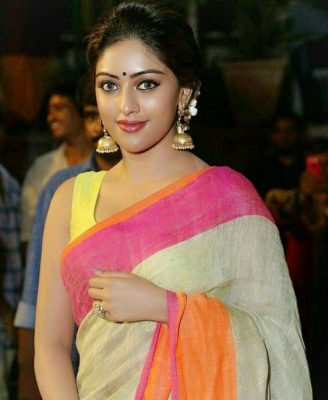 Now a days Indian actresses also using pure linen sarees in there movies also. Nayanthara, samanta, sneha and many more actresses are using pure linen sarees. 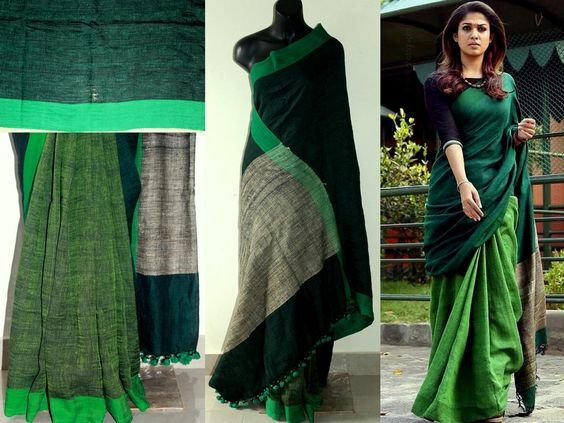 How much is Samantha’s green saree? ?